Lovin' Lyrics Music Promotions: SEVENTEEN.COM PREMIERES VIDEO FOR BRANDON CHASE'S "ONE"
SEVENTEEN.COM PREMIERES VIDEO FOR BRANDON CHASE'S "ONE"
Nashville, TN (June 6, 2014) - Rising star and The Voice season 5 Team Blake contestant Brandon Chase exclusively released the video for his debut single “One” to Seventeen.com today. It’s featured here in conjunction with their “Crush Of The Week” and CMA Music Festival. The video, shot in his home state of Texas, portrays the relatable scenario of Chase seeking one chance with the girl he’s interested in. Chase is participating in his first ever CMA Music Festival this week in Nashville. He’s had a whirlwind week and continued it yesterday when he met up with HLN’s Robin Meade. He did a “blind interview” with the host and country singer while he waited for Meade to “turn her chair around” in their spin-off of NBC’S The Voice. Check out the exclusive segment on Morning Express with Robin Meade here. Chase’s CMA Music Festival is jam packed with interviews, meetings, autograph sessions, and performances and he’s compiling a special behind the scenes look at the Festival for his fans, available online in the coming weeks. For Chase’s current activities, be sure to connect with him via his socials. @BrandonJChase on Twitter, www.facebook.com/brandonchasemusic and @brandonchasemusic on Instagram. Country music artist Brandon Chase is nothing shy of a miracle. Only a few days old, Brandon quit breathing 64 times in 12 hours and was told by doctors he could be deaf, blind, mentally impaired, or possibly all three. Not only did the Arlington, TX native not suffer any complications from his childhood, he instead went on to graduate high school at the age of 15. He then completed his masters certificate in songwriting from Berklee College of Music at the age of 17. Brandon taught himself how to play the piano and guitar and has been writing his own original music since the age of 14. Brandon was featured on iTunes "New and Noteworthy" and also "Rising Stars of Country,” following the release of his latest EP “Country Enough”. His most recent achievement was appearing multiple times on season 5 of NBC's The Voice as a member of Blake Shelton's team. Brandon is currently recording new music set to release in 2014. 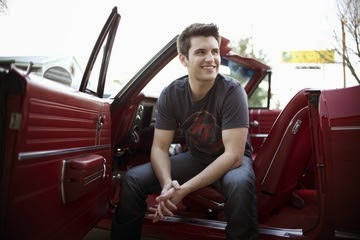 His debut single, “One,” hit country radio on March 4th. For more information, visit www.brandonchasemusic.com.